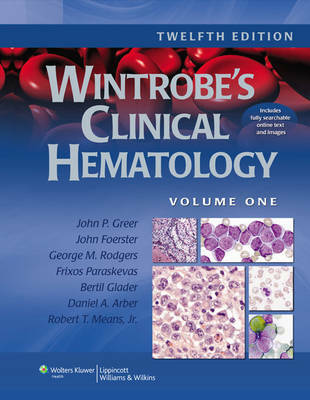 Now available in a thoroughly revised Twelfth Edition, Wintrobe's Clinical Hematology continues to be an industry leader with its ability to correlate basic science with the clinical practice of hematology. With the first edition of Wintrobe's Clinical Hematology published in 1942 clearly establishing hematology as a distinct subspecialty of Internal Medicine, the latest edition continues the influence of the Wintrobe name and helps to set this book apart from the competition. With its strong focus on the clinical aspects of hematology, the book has generated a strong following among internists and general practitioners who want a single resource to consult for their patients who present any blood related disorder. The Twelfth Edition is in full color for the first time, boasts a new editorial team, and includes expanded coverage of new medications and four new chapters on Newborn Anemias, Pathology of LHC, Spleen Tumors, and Myeloproliferative Disorders and Mast Cell Disease. A companion Website will offer the fully searchable text and an image bank.